The continuous plastic pyrolysis plant not only can dispose 20-24 tons of waste plastics per day, but also can work continuously for 24 hours per day without a stop. The following are the main parts and continuous pyrolysis process introduction of this plant. 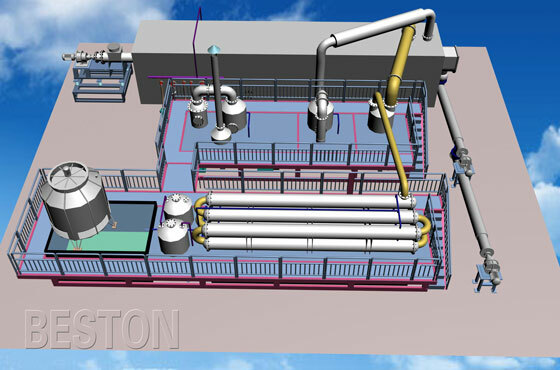 (1) Moving horizontal pyrolysis reactor; (2) Hot air circulation heating system; (3) Oil gas filter; (4) Spray cooling system; (5) Secondary fire retardant damper; (6) Strong spray dedusting system; (7) Oil gas recycling system; (8) Feeder system; (9) Discharging system; (10) Pressure and temperature multipoint monitoring system; (11)Central electric control system. The pretreated plastic will firstly be conveyed to the moving horizontal pyrolysis reactor through feeder system. Then it starts to pyrolysis and oil gas will be generated when temperature rises up to 500 degrees. Then the oil gas will be cooled down by spray cooling system, it would be liquefied and then go into the oil tank. At the same time, some uncondensed gas will come into hot air circulation heating system by secondary fire retardant damper. Then the gas will be recycled for heating reactor as gas material. The exhaust gas goes to the strong spray dedusting system for removing pollution, then the released gas will be environmental and can be discharged to the air. The pyrolysis plant is equipped with the two sealed discharging systems that can automatically get out the carbon black. So far, our plants have been exported to many countries, such as United Kingdom, Turkey, Poland, Nigeria, Ukraine, Romania, Malaysia, Brazil, etc. If you want to know more information about our continuous plastic pyrolysis plant, just feel free to contact us.